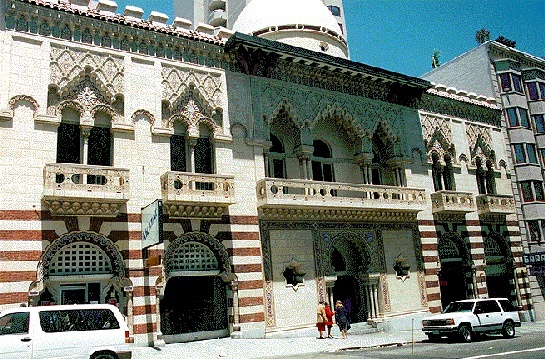 Islam Temple, 650 Geary Street between Jones and Leavenworth. This amazing edifice is modeled after the Alhambra of Granada, Spain. The Tenderloin is San Francisco’s most diverse and unusual neighborhood, and also its poorest. At once condemned and ignored by local politicians, it was – and still is – the site where violence frequently flares. 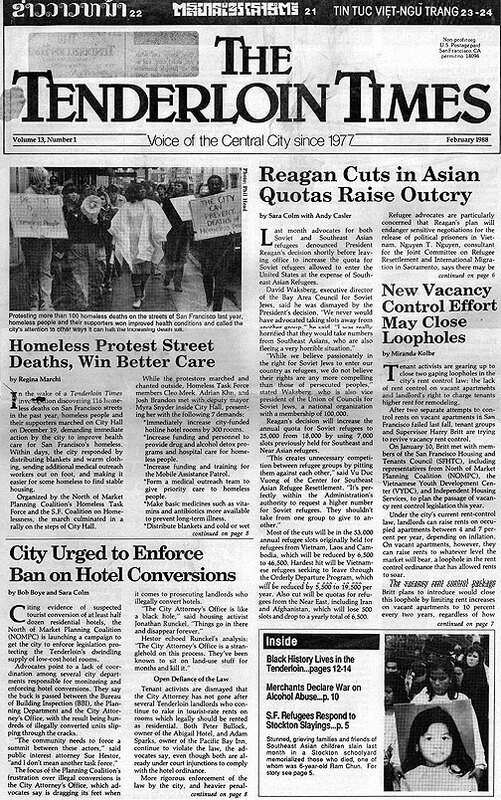 However, since the late 1970s, a time when the Southeast Asian population grew dramatically, the community has led a neighborhood renaissance through multi-lingual newspapers, enthusiastic residents, and organized activists and professionals who were determined to create a lively neighborhood where low-income people can afford to live. First tagged with the name "Tenderloin" decades ago because of its similarity to a New York neighborhood that was regarded as a choice assignment for corrupt cops, San Francisco's Tenderloin is a forty-block section of downtown that is home to some 20,000+ people. It is San Francisco's most diverse and unusual neighborhood, and also one of its poorest. Southeast Asian refugees, African-Americans, Latinos, Filipinos, and Russians all make their home in the 'Loin. So do thousands of seniors and children. Bordered by the theater district and Union Square on the east and City Hall, the Opera House, Symphony Hall, and the glitzy new public library on the west, the Tenderloin has almost everything. High-priced condos on O'Farrell Street. Luxury hotels such as the St. Francis and the Clift. Top-flight restaurants such as Wolfgang Puck's Postrio. Street hookers by the dozens who work the busiest thoroughfares, tolerated by San Francisco juries that refuse to prosecute. Whorehouses posing as massage parlors and strip joints. Drug dealers selling illegal substances and liquor stores vending legal ones. Trendy dance clubs such as Club 181 that attract slumming movie stars like Michael Douglas, next to a liquor store where a customer was recently killed by a stray bullet. A Vietnamese nightclub busted with a stock of high-powered weapons in the basement, a few doors from a well-managed hotel that caters to European budget travelers. Residential hotels with rooms the size of a large closet, and studio and one-bedroom apartments where Southeast Asian families of four, five, six or more members crowd onto the mattresses that get stacked in the corner each morning. Twenty years ago, "affordable housing" developments like the building at 111 Jones Street didn't exist in the Tenderloin. In those days, the area was seen by most San Franciscans as the city's red-light district, a desolate wasteland of prostitutes, drug addicts, and criminals. Echoing and perpetuating the popular stereotype, the San Francisco Examiner called the neighborhood "Hell at your doorstep" and Supervisor Richard Hongisto described it as "a sleazy district that is ... a disgrace to the city." The truth, of course, was much more complicated. The Tenderloin, in the 1970s, was perhaps the poorest district in the city, a neighborhood with a large concentration of low- income seniors, people with disabilities, and single drifters who floated in and out of the neighborhood's single room hotels, eking out a living from casual labor or the meager stipends of the city's General Assistance program. Scores of business spaces sat vacant and boarded up. Its 19,000 residents, for the most part, came in two shades, black and white, but its nighttime population swelled with thrill seekers from throughout the Bay Area who came to the neighborhood to walk on the wild side and taste its illicit pleasures. It was -- and still is -- a neighborhood where violence flared frequently, especially if you were part of its drug scene: In 1976, the Tenderloin had 40 percent of the city's drug overdoses and a quarter of its homicides. The Tenderloin was condemned by politicians and newspaper columnists, but ignored and neglected when it came to doling out city services. It was a neighborhood without the institutions and sense of cohesion that allow a community to define itself. Some people, including social-service providers who worked there, thought that would never change. "The Tenderloin has no social structure of its own," said the Rev. Don Seaton in 1971, as he was leaving his post as the director of Central City Hospitality House, a neighborhood service agency. "It is not a community and never will be. It's impossible to organize the Tenderloin." In less than ten years, Seaton's predictions would be proven wrong. By the end of the 70s, two simultaneous developments -- the influx of thousands of Southeast Asian immigrants and a wave of neighborhood activism and community organizing -- began to transform the Tenderloin into one of the most active neighborhoods in the city, a community with a growing sense of itself and its mission, and a growing determination to fight for its own survival as a neighborhood where low-income people could afford to live. . . The success of efforts to create a sense of community in the Tenderloin and to enhance the neighborhood's political power had four key elements. One was the drive and enthusiasm of residents determined to change their neighborhood. They joined the Planning Coalition in droves and ran spirited campaigns to be elected by fellow members to the group's board of directors. At its peak in the mid-1980s, the Coalition had a dues-paying membership of around 500 people. Another was the large number of activists and professionals who chose to work in the neighborhood. These community workers, a mix of young organizers and people with technical skills and training in city planning, housing development, and newspaper publishing, provided important leadership and savvy to the neighborhood's battle for survival. A third was the community's multi-lingual newspaper, the Tenderloin Times, which consistently investigated and broke important stories that were then picked up by the city's mainstream media. The paper -- which from 1985 on was published in Vietnamese, Cambodian, and Laotian as well as English -- was one of the few community organizations that maintained connections with the different ethnic groups in this increasingly diverse neighborhood. Finally, the infusion of substantial funds from local foundations and charities associated with the Franciscan order sustained these neighborhood projects and allowed them to hire staffs to carry out their work. The activism of neighborhood residents seeking to protect their community made the Planning Coalition and the neighborhood a force to be reckoned with. But, in the end, it also empowered a new set of deal makers and service providers, the skilled professionals who, for the most part, actually did the negotiating on behalf of the neighborhood with would-be builders and city officials, or ran the programs funded by the city or private foundations. Some neighborhood residents seemed to instinctively understand this process. Darwin Dias, an activist and Coalition member active in the campaign to fight the hotels, criticized the luxury-hotel settlement as "chump change." And indeed, if you compare the enduring value of the three hotels, and their permanent, physical presence in the neighborhood with the fifteen-year life of the payments the developers had to make, it's hard to disagree. Even worse was the neighborhood's inability to secure jobs for Tenderloin residents. Though the developers agreed, as a condition of their building permits, to make strong efforts to hire residents, in the end, very few of the hundreds of jobs created at the three hotels went to neighborhood folks. Another resident, Don Davis, was even more critical of the professional activists who worked for community organizations like the Planning Coalition and the Tenderloin Times. Davis railed against them as "carpetbaggers" and charged that they took jobs that should have gone to low-income people. He argued that the neighborhood would be better off if poor people led the resistance. Davis, who survived by scavenging items from Financial District garbage bins and selling them at flea markets, was often seen on picket lines, where his shouting could be heard from blocks away. His style was disruptive and his attacks were often brutal and personal, but his accusations contained a kernel of truth.